Under the pretense of defending an obscure treatise by a Catalan theologian, Sebond, Montaigne attacks the philosophers who attempt rational explanations of the universe and argues for a skeptical Christianity based squarely on faith rather than reason. 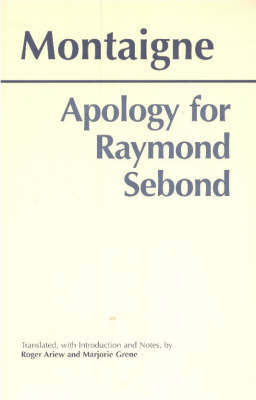 The result is the Apology for Raymond Sebond , a classic of Counter-Reformation thought and a masterpiece of Renaissance literature. This new translation by Roger Ariew and Marjorie Grene achieves both accuracy and fluency, conveying at once the nuances of Montaigne's arguments and his distinctive literary style.